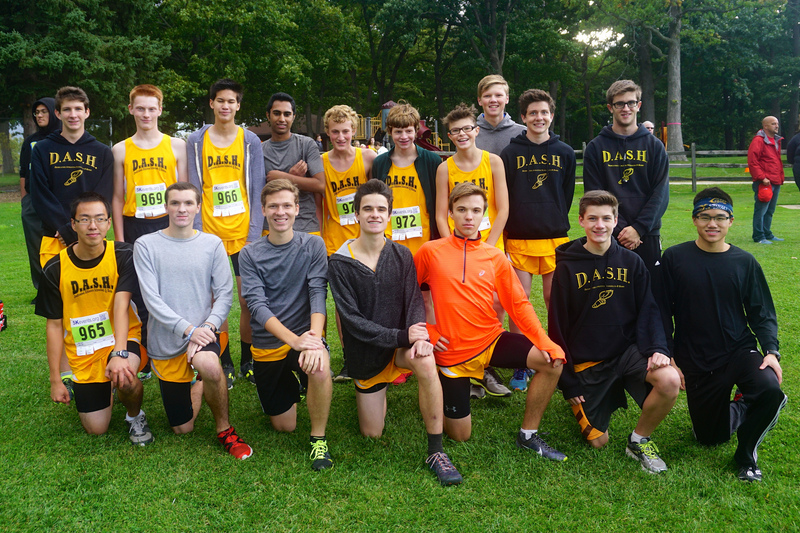 The high school team ran at Mitchell Park last Saturday. DASH fans were everywhere, watching the racing on this very spectator friendly course. The girls got us started, all running in the varsity race. Abigail Westendorf and Emily Caspers were the DASH leaders. Abigail was faster in the end, being the first girl to break the 20 minute barrier this year, to best Emily. 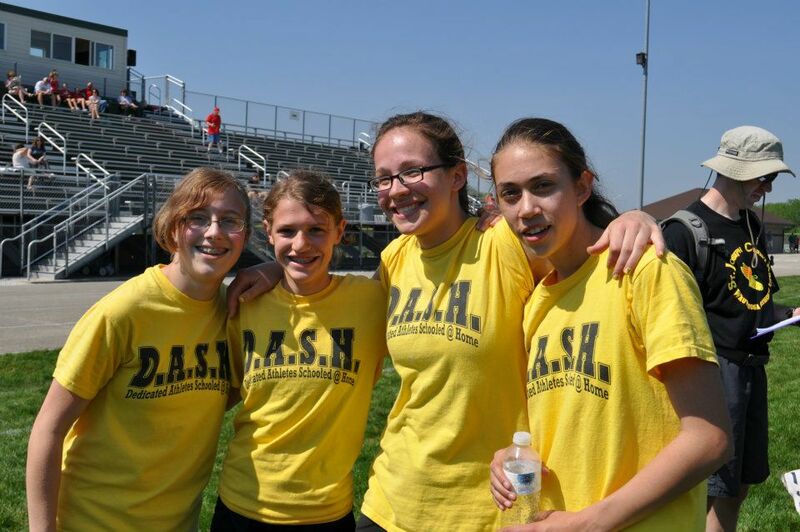 Emily had not been beaten by another DASH girl since she was in the 6th grade. Let’s hope this competition spurs them both to go even faster. The birthday girl, Britta Heiss, came in next, spurred on by her large cheering section. Martha Egan finished right behind to cap the DASH girls race. 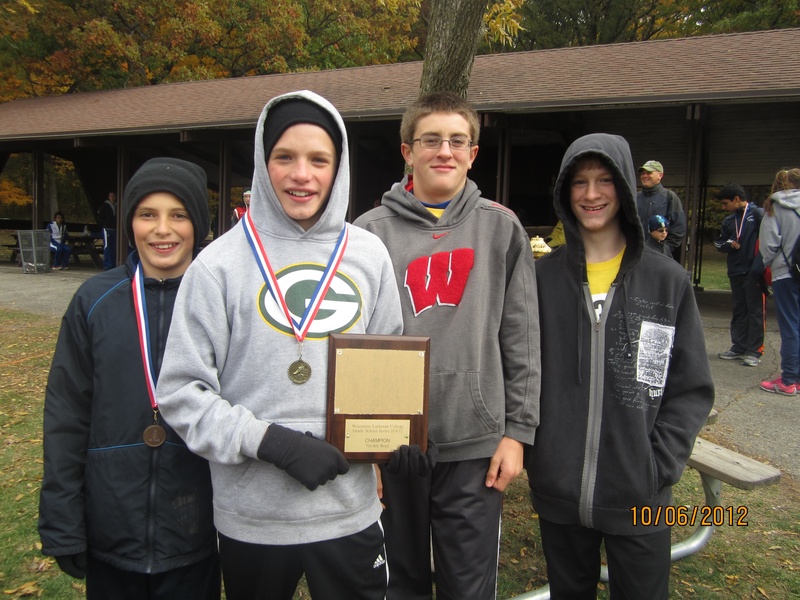 The boys all ran varsity as well. Matthew Hughes ran with the leaders the whole way for an inspiring fourth place finish. His time was 18:04, for another DASH record. How low can he go before the year is out? Tim Egan affirmed his spot as our number two runner with a great showing. Hudson Nyhart came in next with a great last mile, and Zachary Marek came in soon after for another great finish. All four of these boys set personal records. How can you not be excited about that! Dietrich Heiss and Jay Egan followed, Jay also finishing with a personal best. Andrew Rodriguez ran in his first DASH race, Keep your eye on him. I threw him in the varsity race and he held up well. He faded a little in the end, but more practice will fix that. Nathan Dahlin completed our varsity team on this day. Check out the results. We are improving with every race. Half the season is behind us now. We need to keep working hard to make sure the second half will be even better than the first. It is going to be exciting to watch. Thank you to Maura Heiss who made the coffee run to get the day off to a good start. Thank you to Mary Beck for being the scorekeeper again. Thanks to Ken Dahlin and Kam Caspers for taking photos. Thanks to Ed Beck for calling out the mile times. Thanks to all you who prayed for quick healing for my back. Thanks to God for answering your prayers, and giving us such a great day to run. I will be practicing Monday at 6:15 at Greenfield Park this week. Also there will be a Monday Maitland Park practice at 4:00. Check the DASH Calendar for lastest practice schedule at Maitland Park. 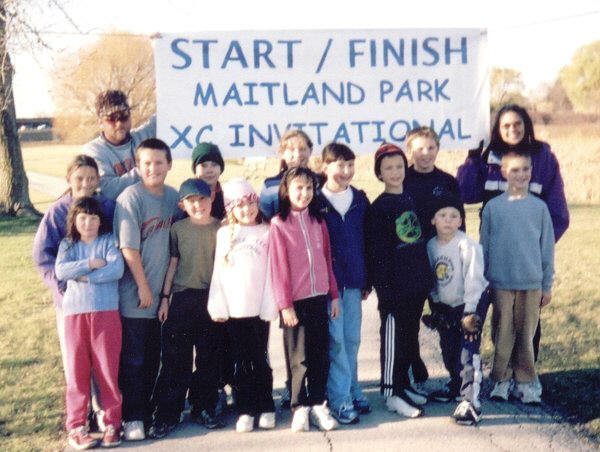 We have a middle school meet this Wednesday at Greenfield Park this week. Map This meet is going to be huge and parking will be scarce in the Lincoln Ave. lot. The Cool Waters parking lot off of 124th St. is a better bet. We will meet where I practice near Lincoln Ave. You are invited to join us at Fazoli’s afterwards. 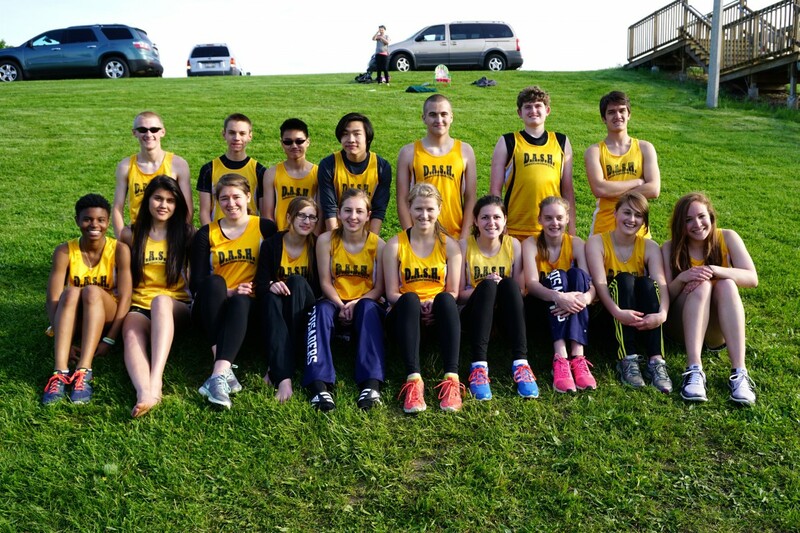 We have a high school meet on Thursday at Armstrong Park in Racine. Map I will probably run all the boys in varsity again unless someone talks me out of it. 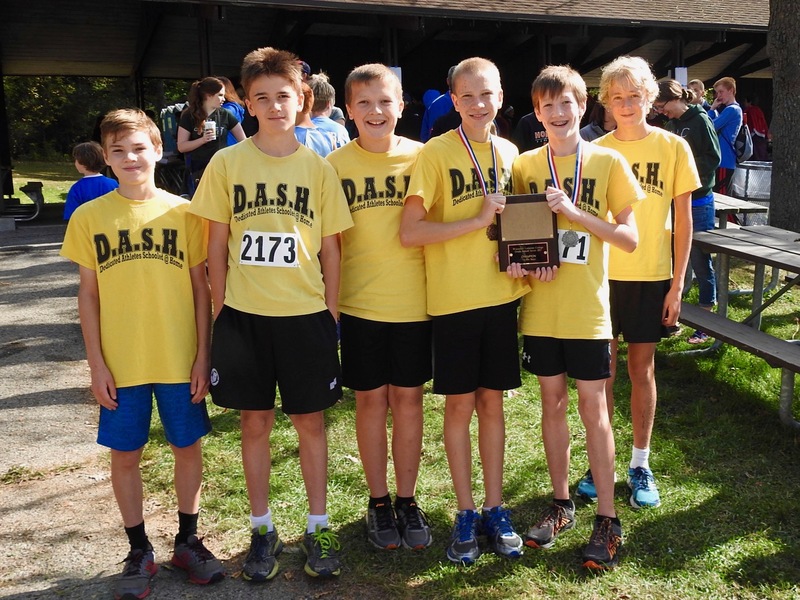 We have another middle school meet this Saturday at Greenfield Park. The meet starts in the same spot as the Wednesday meet. We are running before a college meet and are not to use the Lincoln Ave. parking lot. You can park on the street or in the Cool Waters lot off of 124th St. I plan on staying to watch the college meet. 7th and 8th scored together. 6th and under scored together. Top four finishers in each age group make up team score. Awards: Participation ribbons to all competitors. We are in the middle of the season now. The athletes should be eating healthy, getting plenty of rest, and practicing when they can. Of course, the athletes should keep up with their homework as well. Parents, remind the athletes that you have more fun when you are busy. 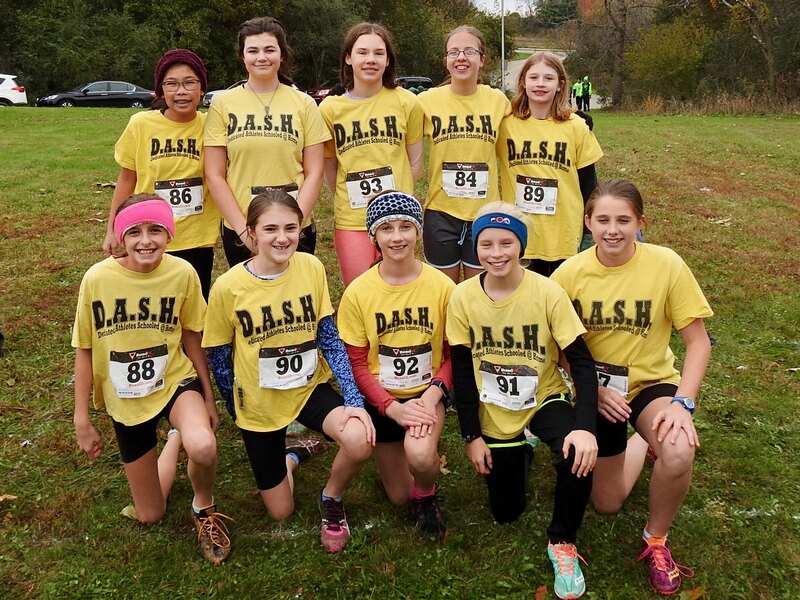 The middle school team ran at Brookfield Academy yesterday. It was quite a change of pace compared to our first two meets. 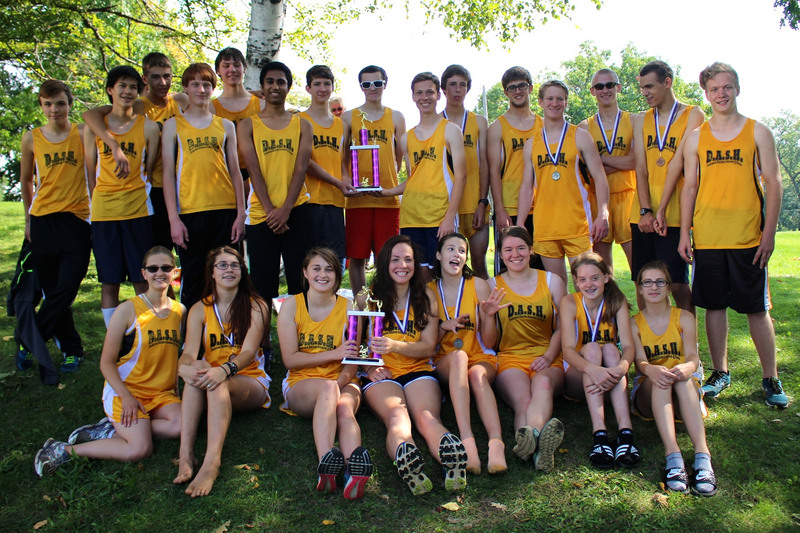 The meet was our smallest of the year with 5 teams, and the longest at 2.25 miles. The weather was much hotter than the previous meets. This made the order of finish very unpredictable. Not everyone would have a great race. This was the kind of day where experience and race tactics come more into play. Courses and weather are always a factor to be dealt with, but especially so when running a long course in hot weather. Testing yourself against such challenges is what make cross country such a great sport. The athletes were out of view for most of the race. This leads to excitement, but also to frustration. What was going on back in the woods? Who was prepared to overcome this day’s challenges? Who was ready to keep up a fast pace on this course? We had to be patient to find out. The girls race was first. All our girls lined up at the start. The usual DASH surge took place. Into the woods they went. Lucretia Nyhart came out first, second place overall, followed closely by Andrea Beck. On closer inspection, Andrea was running with only one shoe, but running fast nonetheless. They would hold their positions for impressive 2nd and 3rd place finishes. Zipporah Caspers and Faith Caspers were seen next. Zipporah finishing 7th overall. Faith, after a strong start, maybe too strong, came in 9th. Veteran Gabrielle Heiss overcame the rough conditions to finish 12th. Five girls in the top 12 for the DASH team! 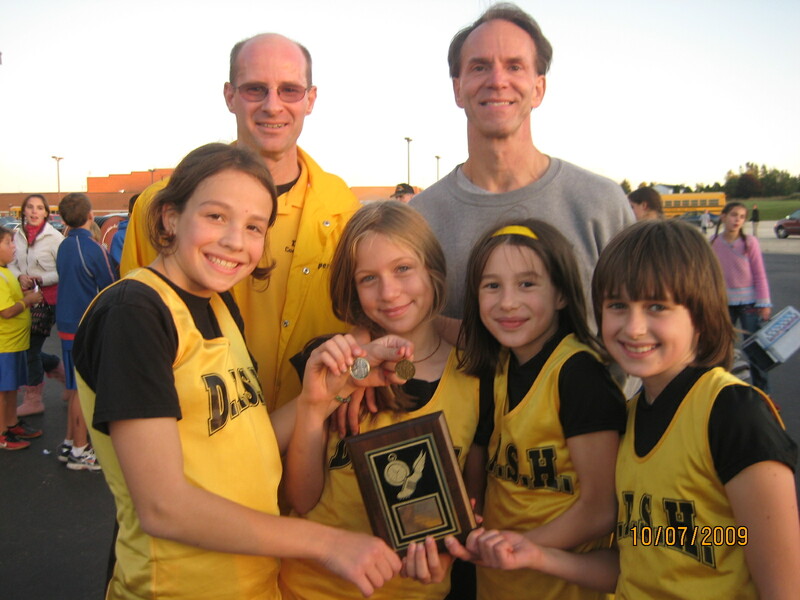 Renee Nurre and Gloria Heiss were the next girls in. Both ran hard, as could be clearly seen at the finish line. The heat got to Siobhan Heiss. You felt the heat more in the woods, and it really slowed Siobhan down. She has five more races to help her forget about it. It was time for the boys race. A pack of four boys came out of the woods over a minute ahead of the rest. Our own Ransom Nyhart was among them, finishing the course in an astounding 13 minutes flat! That was only good for fourth place on this day. The teams we were racing were few, but they were good. Next in for the DASH team was a very determined Zebulon Caspers. Going head-to-head with all his DASH teammates had Zeb running his best. It was good for a 7th place finish. Matthew LeSac and Christian LeSac had their usual strong races to finish 9th and 10th. That’s four of the top 10 for the DASH boys! From here on out the finishes become very interesting. The next boy in was Kevin Egan. Is no course too long for this little guy? Kevin was followed closely by Nick Contino who had another very encouraging race. We had a group of four boys together – Glenn Kaboskey, Ben Contino, Dawson Miller, and Daniel Caspers was the order. The heat and length of the course slowed these older boys down a bit enabling Daniel to keep up. The heat affected Levi Leonard the most, though. This race will give these boys more incentive to run great in the next race. Rookies Tommy Egan and Seth Heinz filled out our team’s finishers. Finishing this long course is an accomplishment in itself. Kudos to all the runners. Thanks to Christine Nurre who helped collect the placement cards. Thanks to those who took pictures and will send them to me. Thanks to the parents who drive the kids to the meets. Thanks to the Ed Beck who is always by my side helping with something. Thanks to Brookfield Academy for hosting the meet. Thanks to those who helped cap off the night at Marty’s Pizza. I have researched the National Christian Homeschool Championships in Springfield, MO further. Last years meet was the first or second ever and very small. This years meet will be much larger. It is on Saturday, October 30th. I may have a girls middle school team set. If anyone else has an interest please let me know. You can still run if we cannot fill out a full team. This is for high school and middle school. Here is a link to the website for further information. If you can’t make it this year, keep it in mind for future years. You can make comments on my posts. (What I am writing now is a post.) If there are any comments on a post, it will list how many under the name of the post. Click on the post title and at the end of the post are the comments. You can also see the latest comments under the ‘Recent Comments’ section of the middle toolbar. If I leave out something important on a meet report, the comment section is your place to fill us all in. You can also use it to tell us something that happened at a meet that you would like to share, or anything else you think the DASH families would have an interest in. 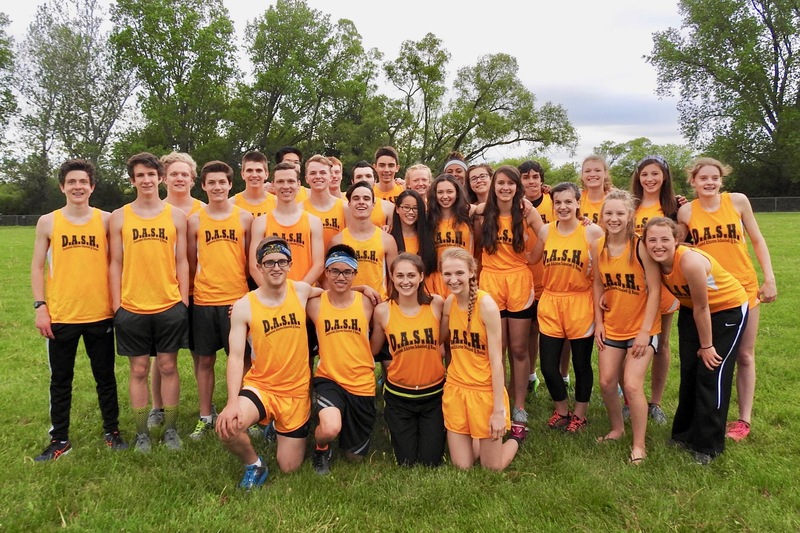 I bring this up now because in the last day we have had three good comments on the blog, one under the Grant Park Meet Report, the other under the Franklin Saber Meet Report, that you may want to check out. The other one is about Boston Store coupons, an important fundraiser for the DASH Team. Your first comment I will have to OK before it is posted. This is to lock out spammers. After I have approved your first comment, future comments will post immediately. I have Grant Park pictures posted. I have some Franklin Saber pictures posted, but this is not a complete set yet. Ken Dahlin provided these pictures. He left in all the dirt. I will fill in the set with some of my own. I hope to see many of you tomorrow at the middle school meet. 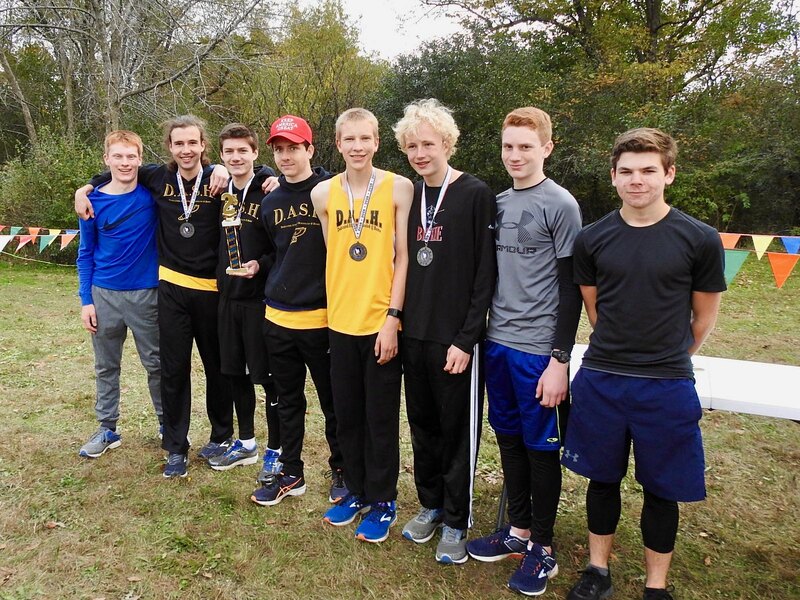 Yesterday the high school team had a meet at Franklin High School – the Saber Invite. With lots of really good high school teams, this was expected to be our hardest meet of the year. This year we got to run it in the rain and the mud, just to make it a little harder. The coach was laying in bed with a bad back, but something as small as that can’t stop the DASH team. Kam Caspers, Ed Beck, and Drew Heiss were there to take over the coaching duties and the team didn’t miss a beat. 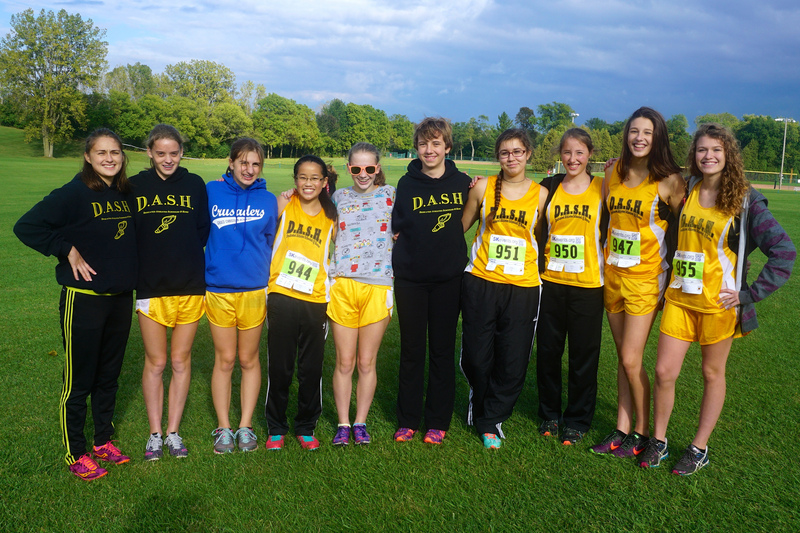 The girls ran in the JV race and all of them set season bests despite the cold, damp weather. Emily Caspers came in first as she has done so many times before. Martha Egan went out at a fast clip, but Britta did catch her before the finish. These girls are getting better as the season goes along. The boys JV race had Jay Egan running by himself. The weather looked ominous at the start, with rain increasing as the race progressed. Jay still ran very well, cutting off over two minutes from his time two weeks ago. Jay’s new shoes are now broken in, and will probably no longer be called white the rest of the season. The officials gathered to discuss the future of the meet. Could it go on in this weather? Because of lightning, the race was put off for half an hour. It was decided OK to continue for the varsity races. The rain had ceased by the boys varsity race, but slick conditions were on hand. How would Matthew Hughes’ shoes hold up on this muddy course? They held up good enough for an 18:15 finish! This is the fastest a DASH athlete has ever gone! Five more races, how low can he go? Next week’s fast course may give us more of an answer. Hudson Nyhart, Dietrich Heiss, and Tim Egan ran with each other for most of the race, but it was Tim this time who came in first. He has been practicing hard and is getting real fast. Dietrich was next with his usual good showing. Both Tim and Dietrich set season bests. Hudson came in soon after, followed by Zachary Marek, and Nathan Dahlin. I will have pictures up soon showing you how dirty these guys wound up. It must have been fun. As usual, the DASH fans were great, even in this weather. Thanks to Kam Caspers, Ed Beck, and Drew Heiss for picking up coaching duties. Thanks to Zipporah Caspers for taking lots of photos. Thanks to my wife Kam who helped me write this report – she was there having fun in the rain while I was suffering in a warm, dry bed. Our next middle school meet is this Thursday, Sept, 23. This is our smallest meet of the season – 3 teams. It will be a good change of pace after the two big meets we have had. All the girls run together, and then all the boys. 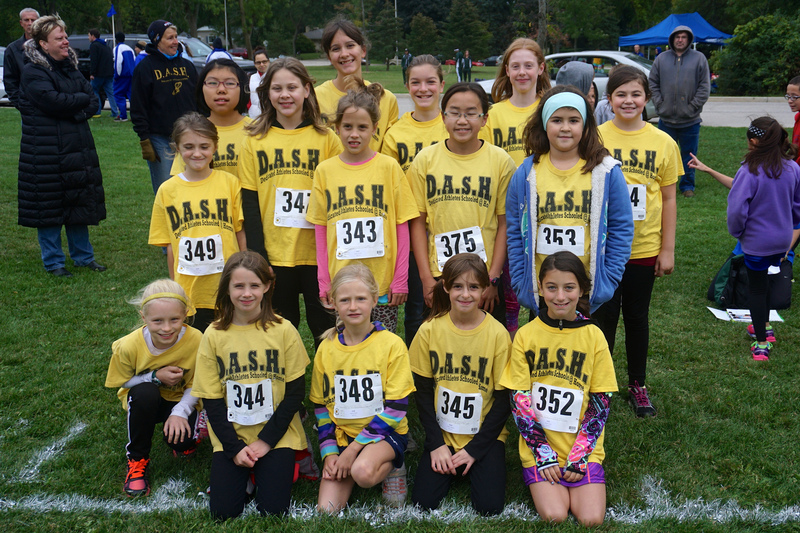 Each race will be scored by grade – 5th, 6th, 7th, 8th. This has been very fun in past years. It may be a long course – 2.25 miles. We will not know the course for sure until we get there. Arrive 3:15 to warm up and scout the course. 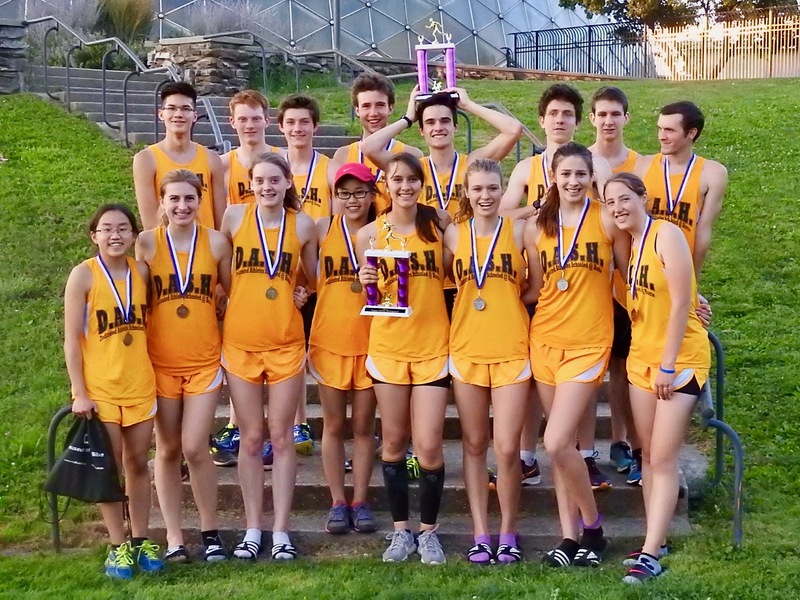 4:00 – girls race, boys race to follow. Directions: Map From I-45 exit at Capital Dr.. Go west on Capital about 5 miles. Turn left onto Brookfield Rd. Go south about half a mile. The school is on both sides of the street. We will meet at the track behind the high school, which is on the west side of the street. I will practice on Tuesday this week, 6:15 at Greenfield Park. Practice at Maitland Park on Wednesday and Friday at 4:00. We have a high school meet next Saturday, Sept. 25, at Mitchell Park by the domes. Details on the DASH Calendar and in a separate email soon. The Westendorf’s would like to invite the high school families to a family picnic on Sunday, Sept. 26. 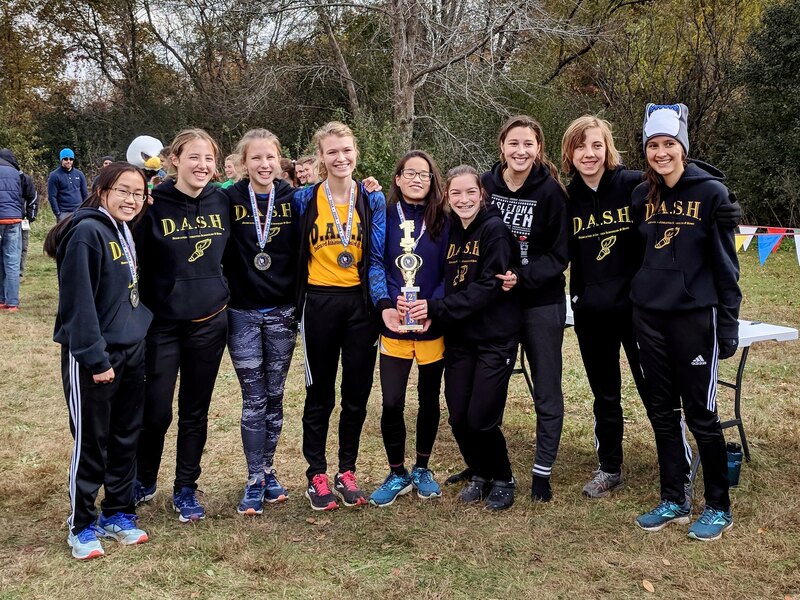 We can meet at 4:00, go for a run about 4:15 – that’s what the DASH team does when it gets together, and have a meal at 5:00. Bring a dish to pass. After the meal we can have an evening enjoying each others company by a bonfire. I have the details on the DASH Calendar and below. Please RSVP Carol Westendorf by Sept. 23rd. I hope to see you there. If you have not heard, my back went out late Friday night. 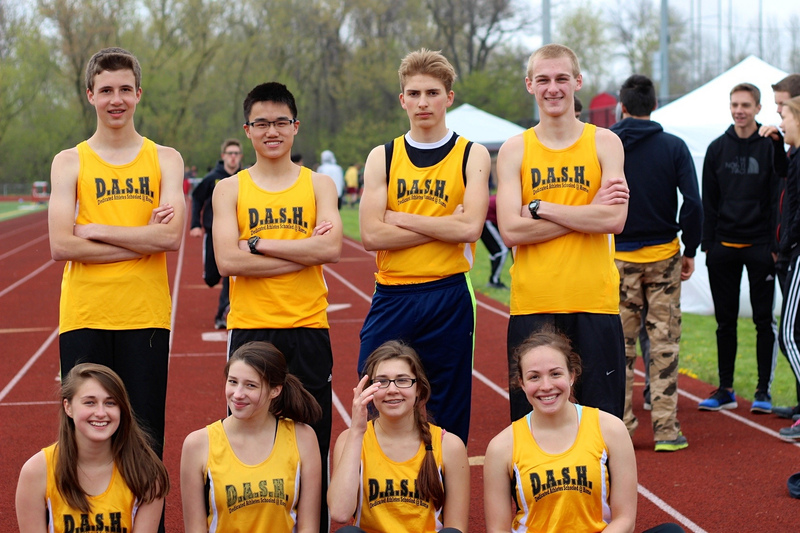 I missed the high school meet yesterday – embarrassing and deflating. I am up a little now and able to sit by the computer and type. Pray that I can make a quick comeback and get back to trying to keep up with the kids. 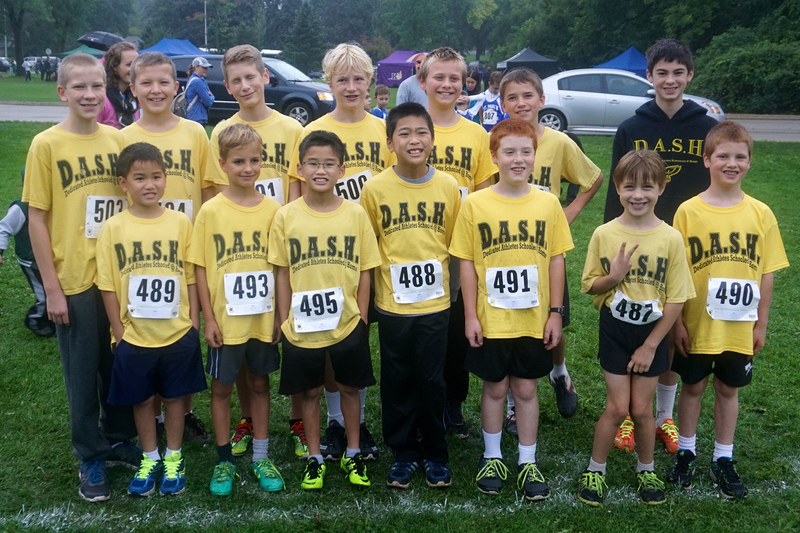 Yesterday was the DASH middle school cross country team’s first meet since their epic 2nd and 3rd place finishes the previous week in Muskego. Could they do it again? Are they really that good? Those were the questions that were to be answered when we took the field at Grant Park. Even my own wife was skeptical that this team could do it again. My wife, who has been a DASH fan since the team began, as this legendary photo can attest, did not seem to be able to believe that we could have really come this far and be this fast. We did have some obstacles to overcome that we did not have at Muskego. Andrea Beck, 2009 DASH MVP, had a viral infection. 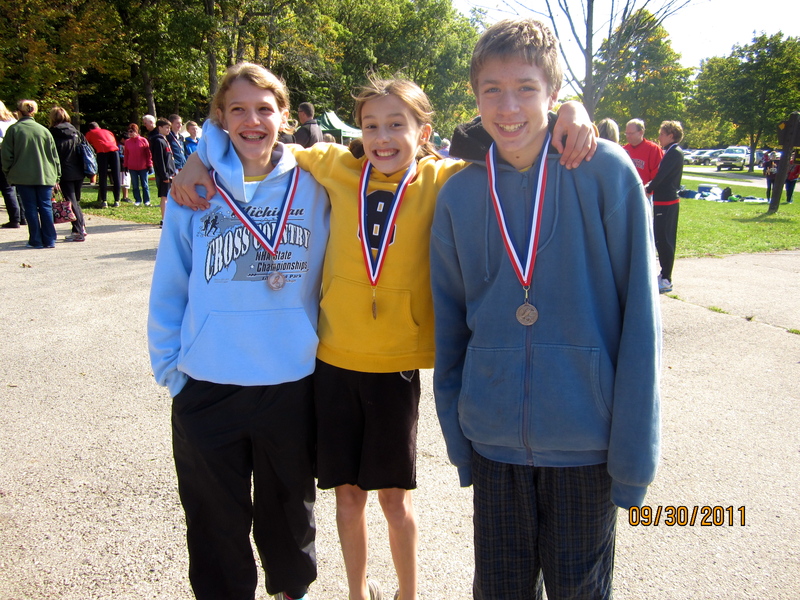 The boys race was marred by, shall we say, a `wardrobe malfunction`. (More on this later.) Would these obstacles bring us back down to earth, or would we be able to overcome them, and stay at the elite level we were at the week before. The races needed to be run to find out – and run they were! The 7th and under girls race was first. Twenty of the biggest teams in the Milwaukee area were there, 244 girls in all. The gun went off. Sarah Klapak went out fast and stayed among the leaders the whole way. This DASH star finished fourth overall for the second straight week. The first answer to our questions was affirmative. Sarah is this good! But in this race, we did not have Andrea Beck running shoulder to shoulder with Sarah. Andrea was running sick, a 5th place finish was not going to happen on this day. We finished 2nd place last week by only two points, so we couldn’t afford to fall back too much. Could the rest of the DASH girls come through? Lucretia Nyhart answered the call, running even faster than last week for a 10th place finish. 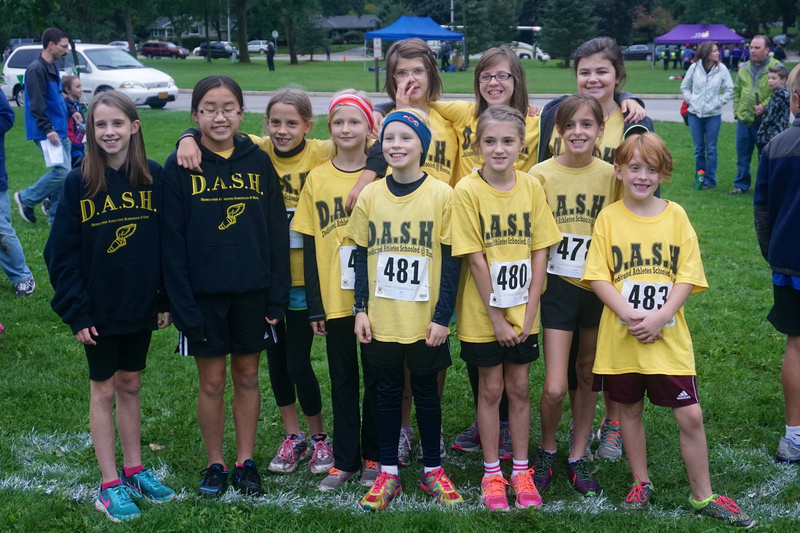 The DASH girls team again had two top 10 finishers for the second week in a row! Faith Caspers was next with an inspiring run in front of her grandparents and the other DASH fans, for a much needed 20th place finish! Zipporah Caspers, always reliable, finished out the scoring with a 30th place finish. Yes, we did it again! 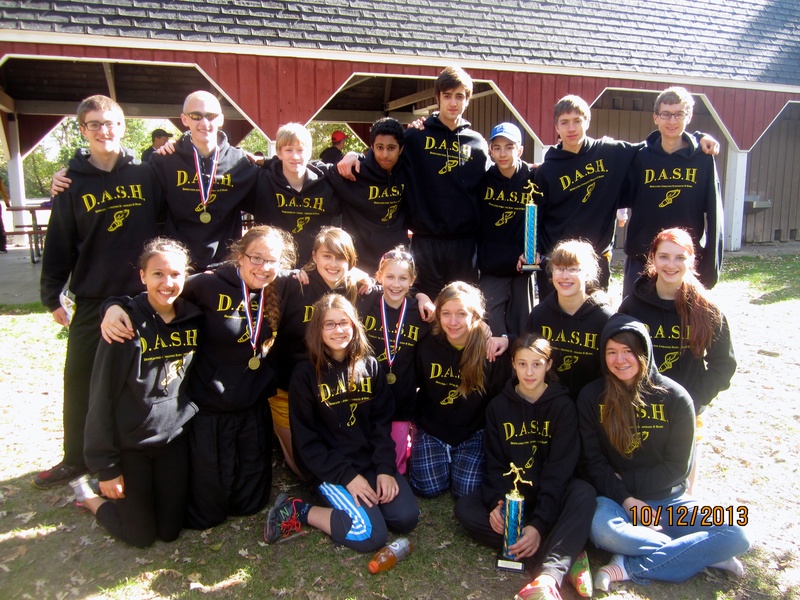 2nd place for the DASH Team! This one may have been more spectacular than the first. Trust me, I run with these athletes, they are this good. But I have hardly begun. Andrea Beck gave it all she had and finished in 34th, giving the 3rd place team an extra point in the process. Kudos to her for giving it a go. Gabrielle continued her great season. Has anyone moved up more than Gabrielle? Again she was in the top quarter. The future stars were next. Renee Nurre had company in this race, running with Gloria Heiss. Gloria was determined to keep up in her best showing to date. Skyler Heinz cut 3 minutes off her time from last week. Encouraging. The 7th and under boys race was next, but all was not well. The early surge was missing on this day. The cause? Christian LeSac had lost a shoe! Another race with obstacles to overcome. Christian got it on as fast as he could, but he was running in 240th place after the first stretch – out of 240. Would Christian be able to catch up with his team? Would these dedicated athletes be able to step up after Christian’s bad luck? Ransom Nyhart did his share with another top 10 finish, coming in 9th to keep us in the running for a good overall score. Still, could we repeat a 3rd place finish from last week. Matthew LeSac did all he could, continuing his great running with a strong 28th place showing. So far, so good. In the meantime, Christian was moving up steadily, ultimately passing every other DASH runner, and 196 runners in all, to come in 44th. Amazing! Levi Leonard, Glenn Kaboskey, and Dawson Miller really gave it all they had to come in 45th, 49th, and 67th. 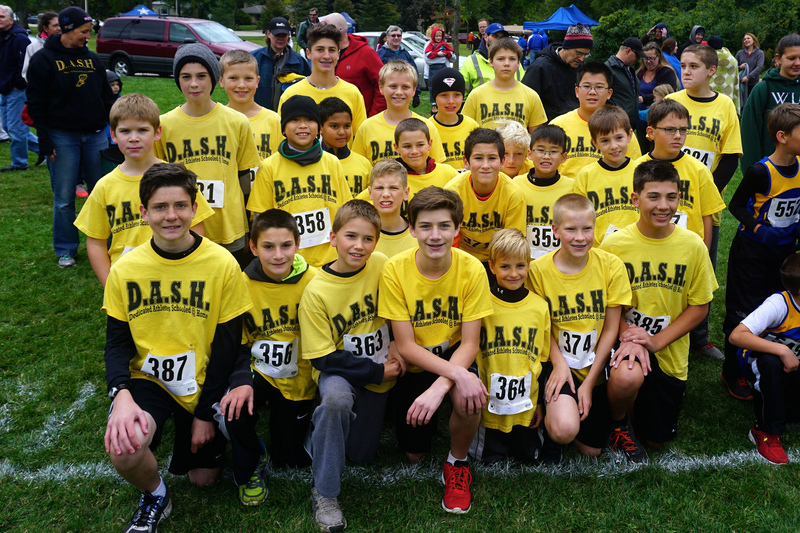 Glenn’s great race last week has inspired some great competition among these boys, and they are really going fast. Ben Contino and Kevin Egan were much improved over their good races last week. DASH veteran Jeremy Marek had a tough day, but he’ll be back, you can count on that. All these boys were in the top half of finishers in the race. This is a really good team. Daniel Parsons beat out Daniel Caspers for the fastest Daniel award, and it was a battle, going back and forth until the end. Very fun to watch. Tommy Egan really improved over last week, while Seth Heinz cut 5 minutes(!) off his time from last week. That’s improving. How did the team finish overall? We took 5th place, missing 4th place by one point. A heartbreaker in the end for this team, but a finish we can all be proud of. There are a lot of teams looking up at the DASH team. You can see for yourself here. Siobhan Heiss struggled again running in the 8th grade by herself. She will have company in the next three races. Don’t count out our track MVP yet. The big guys ran in the last race again yesterday, and again they ran hard. Zeb Caspers and Nick Contino are our big guy duo. 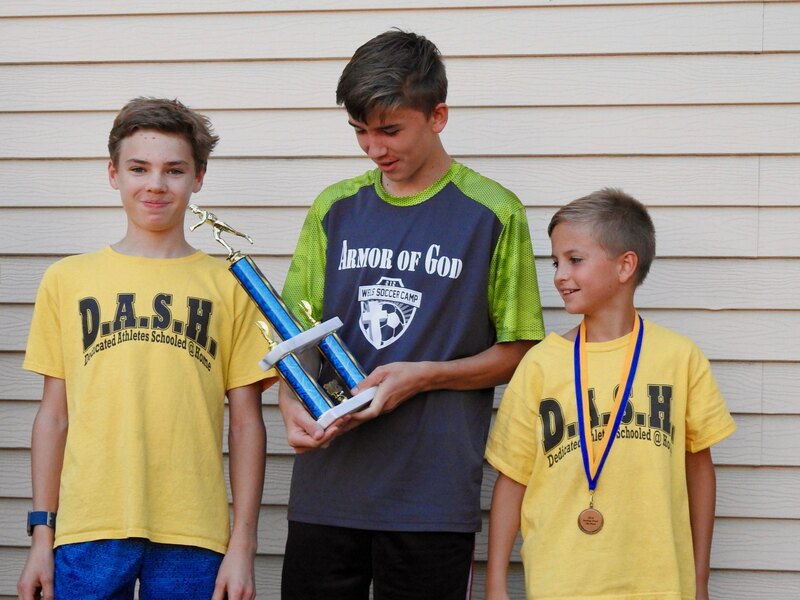 Unfortunately two runners do not qualify for a team score, but you will be hearing more about these two soon as they will be joined with our seventh graders in most of the upcoming races. That’s a team that I can’t wait to see. In my mind the questions have now been answered. Tell everyone to come out and cheer the DASH team. They are a team we will be talking about for a long time. Thanks to timekeeper Mary Beck, card collector Emily Caspers, and the many photographers who will hopefully send me their pictures, and especially to all the great DASH fans cheering the athletes on. Once again the DASH fans really stood out. Thanks also to George Klapak who helped me with the athletes at the start. The meet will be timed by PTTiming, so be prepared to put chips on your shoes. I hope to see you there. I have been adding to the Results Archive. Check it out to see some famous DASH names from the past. I also have photos from all our meets but yesterday’s on our Flickr site. I think they are very good, if I do say so myself. If you have photos you would like to send me, please do. I would like them from this year’s races, as well as previous years, track and cross country. I will be working on building up the Flick site a lot more through the off-season, but I need help getting more pictures. I have been thinking of ordering some DASH apparel so we can look even more dashing at the meets. For those interested, let me know what you would like – hats, shirts, sweatshirts, jackets, etc. We are already the team with the best fans. 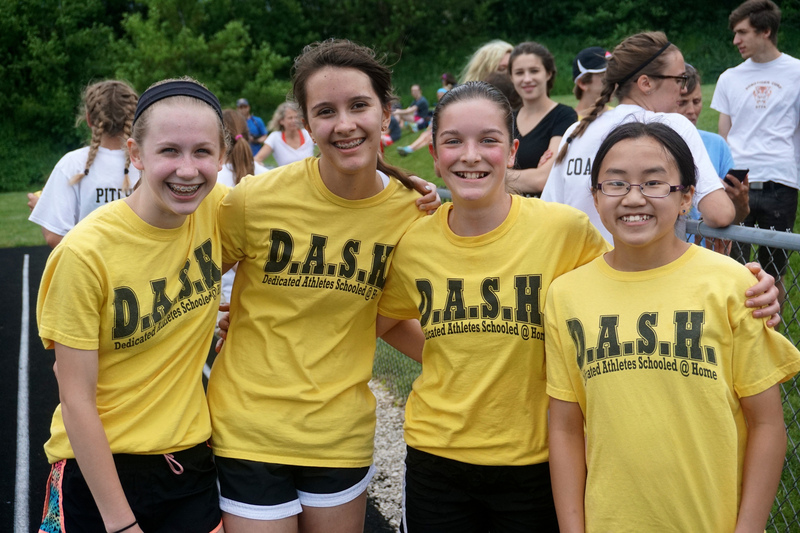 Dare we all come wearing DASH apparel? Don’t worry, I would never ask us all to come donning the same haircut as the coach.